On a large ship cruise you will have to bring a LARGE telephoto lens to capture whales. This is not the case with a small boat cruise. On our boat, you’ll have to worry about not getting your camera wet from the spray of a surfacing whale. No joke. View the video below of a GoPro under the surface of the water next to our boat. During the summer months, whale watching is one of the most popular activities within Alaska’s Inside Passage and the Frederick Sound. Our small ship Alaska cruise takes you to these magnificent creatures and put you in position to see many different types of whales in their natural surroundings. 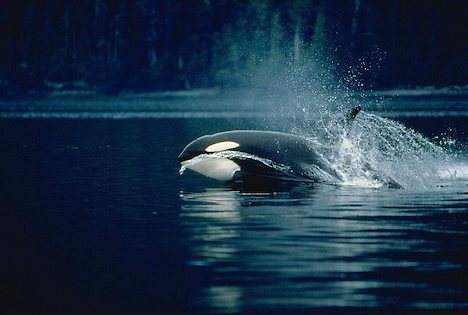 Several species of whales can be observed feeding in the waters of Alaska. Humpback whales travel from the warm waters off of Hawaii to feed in the nutrient-rich waters of southeast Alaska. Orca (Killer) whales can also be found in these waters. Other species include: Harbor porpoises, White-sided dolphins, Grey whales, Minke whales and the playful Dall porpoise. If you spy something leaping from the waves near our bow or playing in the ship’s wake, it is probably a dall porpoise. They are well known throughout the Inside Passage for their playful attitude, and they love to put on a show for our guests. This makes Alaska whale watching one of the best experiences passengers have while on-board the MV Sikumi. These black and white porpoises are not to be mistaken for orcas, and have body shapes that more closely resemble a bottlenose dolphin than a Killer Whale or Beluga. They live here year-round and feast on squid, sardines, and many other small fish. Like other whales and dolphins, they live in small groups known as pods. When you are whale watching aboard your Alaska small ship cruise, keep your eyes open, and you will likely get the delight of seeing a dall porpoise playing nearby. An Alaska cruise is an opportunity to get a rare glimpse of one of Alaska’s greatest beauties. We can take you to places where you are most likely to spot these majestic creatures. We are always careful to obey regulations and restrictions regarding safe viewing distances, but we cannot control the whale’s agenda, as they have been known to surface a few yards away from the M/V Sikumi. Our small cruise ship is one of the most unique and rewarding means of accessing the whales. We invite you to let Custom Alaska Cruises be your guides on your Alaska cruise. We’ll help make your cruise one you’ll never forget!